The sun sign of Cancer is dominated by Moon. Though, as per astronomy, Moon is not a planet, astrologers believe it to be so. The influence of Moon on the Cancerian zodiac is quite changeable. However, it can be understood and thus, controlled, to quite an extent. Individuals who have the Moon as their ruling planet tend to have a very vivid as well as colorful imagination, which at times borders on the fantasies or may lead to excessive worry and even hysteria. The moods of a June-born tend to vary a lot, at times to extremes, making him highly unpredictable. Moon symbolizes the soul, the unconscious self of an individual. It is believed to be associated with femininity, fertility, emotions, maternity, family bonds, sensitivity, memory, death and decay. 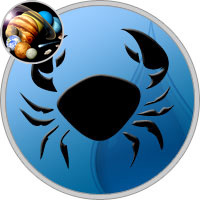 The ruling planet of Cancer tends to move through the entire Zodiac, with such a speed that astrologers believe it to influence other signs too. The orbital plane of the Moon, known as the ecliptic, has a cycle of 13-1/2 days. The position of the planet at the time of birth of an individual is said to have a major influence on his personality. A person born during the time when Moon is in its waxing period tends to be younger, more imprudent as well as more impulsive. Those born during the waning period of the moon tend to be older and more thoughtful. Moon displays the power of internal light and signifies the nature of an individual as seen by the others. It has an influence on his feelings, his manner of handling the relationships and also his response to different circumstances. Physical, emotional and mental aspects of his personality also come under it. The nature of a Moon-ruled individual is very adaptable and has generous doses of understanding, empathy, economy and meticulous planning. On the other hand, he may become prone to indecisiveness at times. Items related to the ruling planet of Moon are daisies, poppies, wallflowers, willow trees, melons, potatoes, lettuce, shellfish and domestic farmyard animals. The closest metal is Silver the closest stones are Opal, Pearl and Moonstone. The lucky day for Moon-dominated is Monday and lucky colors are green, silver-grey, cream and white. To make life easier, surround yourself with comfort: a cozy sweater, a favorite book, trusted friends, and a stash of your favorite goodies. Cancers are close to their moms, so keep yours on speed-dial and call her when you’re down. You may be an unofficial mom to everyone in your life, too. Taking care of kids, friends, and pets can keep your spirits high. The ruling planet for Cancer is The Moon.